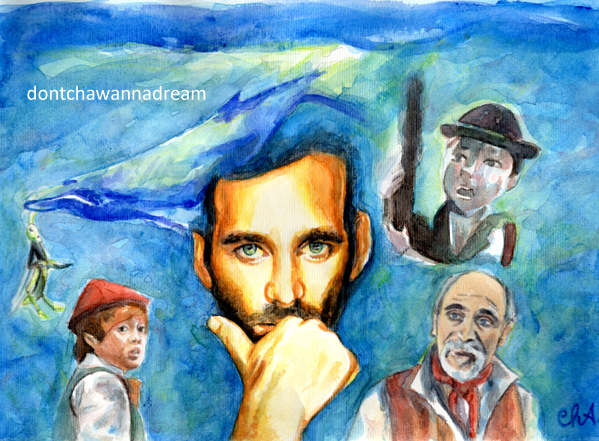 Eion Bailey as Pinocchio/ August Booth in Once Upon A Time. Your painting is fantastic, Cha! Happy September to you too. The portrait is great, as always, and I really like the way you incorporated the whale in the background. Thanks a lot, Binky!! 🙂 So glad you like it. Wonderful combination of characters in your painting, Cha! Have you seen Grimm (TV Series). It is pretty cool and runs along similar lines. No, I’ve never watched Grimm. I will. But it’s so hard to find the time to watch all these great tv shows. Thank you. Have a great day, Hanneke!